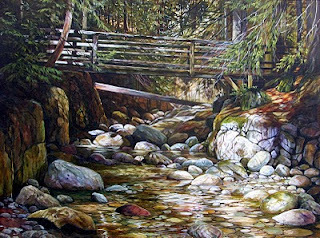 I just finished the first really big painting for 2010- "The Bridge" 30 x 40" acrylic. 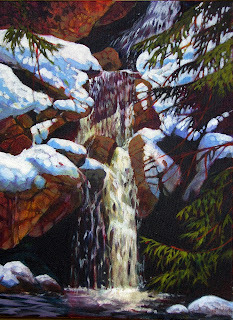 It was a joy to paint because it took me back to that beautiful place where I took the photo. 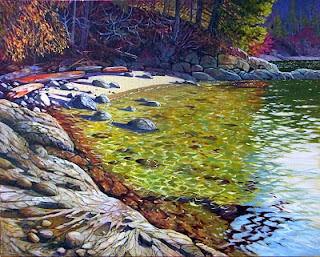 This painting will be my image for the catalogue for the very popular Painters at Painters event, held in Campbell River, BC every May. I'm finally getting around to putting some new stuff on the blog. It's been a busy time with the studio open house last weekend. Thanks to all who took the time to drop by- it was great to see everyone. 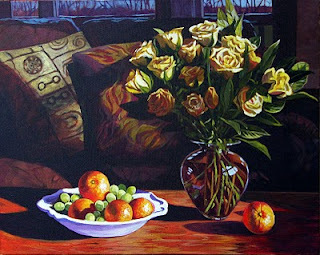 I'm feeling settled in to the new space now and three new acrylic paintings have been born. "Grimmer Bay"- 24 x 30, "Roses in Winter"- 24 x 30 and "Winterfall II" 12 x 16. Today I plan to start a big one- 30 x 40. Probably will be a river canyon scene- I can't resist those rocks and water!